ST. PAUL (December 2013) -- Skyline Exhibits has been named the winner of one of three Eddie Awards given by the Exhibit Designers and Producers Association (EDPA) for marketing excellence at the EDPA ACCESS event on December 5th, 2013 in Marco Island, Florida. Skyline won in the category of 'Online or Multimedia' for the global launch of its new product, Skyline WindScape™. "We are honored to be recognized by our industry peers within the EDPA for our successful Global Launch event," said Skyline President Bill Dierberger. "The EDPA is a great organization so having its members validate our success makes me even more proud of our team." 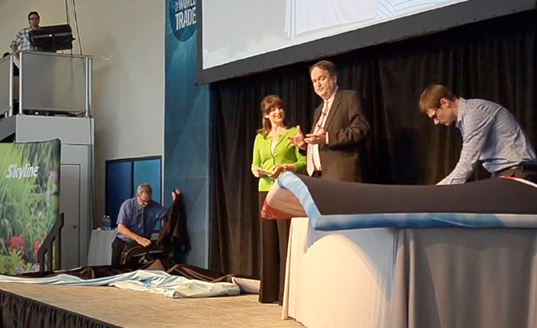 The Skyline Global Launch event was centered on a 30-minute simulcast of the WindScape™ product launch hosted at Skyline's International Design Center on July 10, 2013, in St. Paul, Minnesota. Some of Skyline's global dealer network hosted additional hybrid events simultaneously in 27 other locations around the world. For attendees in locations without a live event, interested prospects could watch the entire event streaming online, with content created by Skyline just for virtual attendees before and after the main live event. There were 2,190 attendees who attended live or online." Key aspects of this award-winning multimedia campaign included a series of wind-themed teaser videos, email invitations, a dedicated website, social media integration, and a live, streaming video feed seen around the world. "Skyline has recently been recognized for its product innovation by winning a 2012 Outstanding Corporate Innovator (OCI) Award and by being nominated for the 2014 Edison Awards," said Dierberger. "This year, we won the Progress Minnesota Award and were named a Minnesota Business Manufacturer of the Year finalist. By winning the Eddie Award, Skyline has been acknowledged for its marketing excellence as well." "The Skyline® WindScape™ Exhibit System is game-changing new technology, unlike anything else Skyline has ever introduced," said Jon Althoff, Skyline Senior Director Global Marketing. "For a product unlike anything we've introduced before, it needed to be launched in a way unlike we'd ever done before. This Global Launch was that breakthrough marketing event, equal in its innovation to the product itself. The event's success was secured by the efforts of many at Skyline, including showcasing the video and graphic talents of Skyline's newly launched Creative Services Group, under Julie Heck's leadership. But the Global Launch event itself could not have been pulled off without the diligence and teamwork of Mike Thimmesch (Director, Customer Engagement and Industry Relations) and Sofia Troutman (Segment Manager, Solutions)." The result? Skyline WindScape™ is already setting records within Skyline as the fastest adopted new product line in the company's history. And that is saying something, since 27% of Skyline's sales come from products that have been introduced in the past 5 years.